Amir D. Aczel (amirdaczel.com) writes about mathematics and physics and has published 18 books, numerous newspaper and magazine articles, as well as professional research papers. A Higgs candidate event from the ATLAS detector of the LHC. What made me fall in love with theoretical physics many years ago (in 1972, when I first met Werner Heisenberg) was its stunningly powerful relationship—far beyond any reasonable expectation—with pure mathematics. Many great minds have pondered this mysteriously deep connection between something as abstract as mathematics, based on theorems and proofs that seem to have little to do with anything “real,” and the physical universe around us. In addition to Heisenberg, who brilliantly applied abstract matrix theory to quantum physics, Roger Penrose has explored the deep relation between the two fields—and also, to a degree, between them and the human mind—in his book The Road to Reality. And in 1960, the renowned quantum physicist and Nobel Laureate Eugene Wigner of Princeton wrote a fascinating article that tried to address the mysterious nature of this surprising relationship. Wigner marveled at the sheer mystery of why mathematics works so well in situations where there seems to be no obvious reason why it does. And yet, it works. Wigner had contributed much to physics using very advanced mathematics: he was one of the pioneers of using mathematical groups to model physical phenomena. Group theory is the mathematical branch dealing with concepts of symmetry. As Wigner helped us see, symmetries can reveal the deepest secrets of physical reality. Such symmetries, for example, allowed Steven Weinberg to actually predict both the existence of the Z boson and the actual masses of the Z and the two W bosons, which act inside nuclei of matter to produce radioactive decay. In doing so, Weinberg exploited what he called “the Higgs mechanism,” which he hypothesized to break a primeval symmetry of the early universe and thus impart masses to these three particles—and presumably also to all other matter in the cosmos. When the discovery of the Higgs boson was announced at CERN on the 4th of July, this immensely important scientific triumph of our time also lent further support for Weinberg’s theory. The fact that the “pure” mathematics of group theory can help produce such accurate physical predictions as Weinberg’s seems like nothing less than a miracle. But in fact, the connection between mathematical groups and physics was established eight decades ago by the brilliant German-Jewish mathematician Emmy Noether, who barely escaped Nazism only to die from an abdominal tumor in the United States shortly after obtaining a professorship at Bryn Mawr, which had allowed her to leave Europe. Noether devised and proved two key theorems in mathematics, called Noether’s Theorems. These powerful mathematical results established the relationship between the symmetries of group theory and the all-important conservation laws in physics—such as the conservation of energy, momentum, and electric charge. In the 1960s, symmetry went wild! Murray Gell-Mann, sitting at an international conference at CERN in Geneva one day in 1962, was able to look at symmetries described by formulas written on the board, run down the aisle and write excitedly on the board his prediction of the existence of a new particle, called the Omega Minus! (later confirmed in particle accelerator work). The electroweak symmetry of the photon, the Z, and the two Ws was broken when these four photon-like particles turned into 3 massive particles (hence mass was “imparted” to them through the Higgs mechanism) and one remaining massless photon (see my previous post). ** The deep theoretical idea of a broken symmetry producing mass thus led to the theoretical birth of the Higgs boson: the then-hypothesized, and now tentatively confirmed, existence of the field associated with the Higgs particle, which through an interaction with the electroweak field gave us mass. Peter Higgs and his colleagues (Brout, Englert, Hagen, Kibble, and Guralnik, all of whom had the same idea in 1964) were able to exploit the idea of a symmetry to predict the existence of a particle-wave-field that gave mass to other particles and to itself when the universe was very young. The Higgs itself was thus born from the pure mathematical idea of symmetry, captured through the theory of continuous groups. To be sure, this idea was already “in the air” before these papers were published, and other theoretical physicists had understood it well and published papers about it from 1954 to 1961. But a deep trap quickly materialized. A physicist now at MIT, Jeffrey Goldstone, had (with the help of Steven Weinberg and Abdus Salam) proved a theorem that showed that, under certain circumstances, “bad” particles—massless like the photon—somehow appear when the primeval symmetry of the universe (in which the Higgs supposedly did its mass-giving magic) breaks down. This was devastating news: the physicists didn’t want these massless bosons there, since they ruined the theory about how mass can be imparted to particles. Something had to be done about it! So then came our “gang of 6” (Higgs, Brout, Englert, Hagen, Kibble, Guralnik) and, technically, what they all did was to show that the offending Goldstone theorem did not apply to the particular symmetry relevant to the early universe. **** And so, with the hurdle of the nasty Goldstone-Weinberg-Salam theorem finally removed, the road was finally wide open for the greatest symmetry of all time to break down dramatically through the interaction of the electroweak field with the Higgs field, resulting in mass being given to the Ws and the Z, leaving only our lonely photon as massless. This purely theoretical advance in 1964, culminating in Weinberg’s Nobel paper of 1967, thus made the Higgs mechanism emerge triumphant, and mass was shown to be conferred to particles—allowing us to come into being and contemplate the birth of the universe we live in now. It all happened because of the mathematical idea of symmetry and the uncannily powerful relationship between pure mathematics and theoretical physics! * Two more quick examples of symmetries in physics: Einstein’s general theory of relativity enjoys an important symmetry called “general covariance“—and it gives the theory its power and validity. Maxwell’s theory of electromagnetism has a particular Lie-group structure that allows the theory to remain valid even when “rotated” in an abstract mathematical space through the action of a mathematical group. The group involved here is the group of all possible rotations of a circle (rotations by any given angle). This Lie group is called U(1). ** This symmetry is modeled by the continuous group SU(2)xU(1), a product of the “circle rotations” group U(1) and the group of special unitary 2 by 2 matrices, SU(2). This composite group is believed to have governed the electroweak symmetry that existed shortly after the Big Bang and which broke down through its field interacting with the Higgs field. It was explained by Steven Weinberg, Sheldon Glashow, and Abdus Salam, The full standard model is represented today by the composite group SU(3)xSU(2)xU(1), which adds the quarks (with their 3 color charges) to the picture. *** It shows the proton, neutron, and xi, sigma, and lambda mesons (intermediate-sized composite particles). This is one representation of the Lie group SU(3), the group of special unitary 3 by 3 matrices. **** It’s called a Yang-Mills gauge symmetry: a particular kind of continuous, Lie group symmetry. How can a particle (The Higgs) give itself mass? @A.Amiri (and earlier commenters on my previous post): The Higgs, as a particle, gets its mass by interacting with its own field: in the same way that an electron interacts with its own electromagnetic field–the field that the electron’s own charge generates. self-interactions lead to “self-energy” and are a common phenomenon in particle physics. Here, the interaction is with the Higgs (scalar) field. This blog claims that Weinberg’s 1967 paper predicts the masses of the W and Z bosons. I don’t think that is true. The Weinberg angle enters into their masses and no human knew its value. The blogger should look this up and make any necessary corrections. Amir, isn’t this Scalar Boson discovery at 125 GeV too light to be the Standard Model Higgs? I have read that it would require a heavier super-partner to fulfill that role. The problem with this though is that no evidence for Super-symmetry has so far been found, including at the LHC. if the higgs particle can self interact to higgs field, then why not it is also possible to interact the other particles themslf with the higgs field to gain mass without higgs particle.no one has its answer- so higgs particle and its fuction is just hypothetical yet.no one can prove yet. I’m not a particle physicist, but I would nitpick this article for its seeming conflating of giving all particles mass and why there is matter in the universe. Higgs gives some fundamental particle mass. But its a mess, some doesn’t get it (photons, gluons), some gets it from the field (many standard model particles), some gets it from the particles (Zs/Ws), some doesn’t get it proportionally to energy as I understand it (visible higgs), some gets it somewhere else (neutrinos). More importantly here, higgs gives us only ~ 1 % of mass as I hear it. The mass of nucleons comes from strong force interactions, I assume. But higgs does predict the lower mass of the proton (I hear), which is why it instead of the neutron is stable and why we have atoms. Yes, I know, details. But details is the story at large sometimes. Wigner marveled at the sheer mystery of why mathematics works so well in situations where there seems to be no obvious reason why it does. And yet, it works. And then came anthropic theory and showed how the physics of nature and by analogy the mathematics of men can be cherry-picked – because it works for us. II wonder how Wigner took that. Mass of nucleons comes _mostly_ from strong force interactions, natch. @”Peter”: I don’t know who you are, but before you make such a patently false accusation, shouldn’t you check the source? Steven Weinberg, “A Model of Leptons,” Phys. Rev. Lett. 19, 1967, p. 1265: “Note also that (14) gives g and g’ larger than e, so (16) tells us that MW>40 BeV, while (12) gives MZ>MW and MZ> 80 BeV.” “M” stands for MASS. Please don’t make false statements about something if you know nothing about it. This is a serious science forum. Thank you. @Julian Mann: Yes, they have absolutely no evidence of supersymmetry, so the superpartner may not exist. From what I understand from CERN, the mass range of 125-6 GeV, a “light Higgs,” is consistent with the standard model. It’s because everyone was rooting for supersymmetry (perhaps) that they searched the upper range to the 400s of GeV first–but found nothing there! In fact, as you may know, a “light Higgs” was well within the range that Fermilab explored before shutting down the Tevatron, but they never reached enough “sigmas” (the required 5, for statistical significance) as they didn’t have enough luminosity (intensity of the beam: number of particle interactions per second) and the Higgs is a rare event that requires a lot of data. So CERN beat Fermilab not because of its higher energy (7 TeV at present, with half-power, versus Fermilab’s 1.98 TeV), but rather because of the much higher luminosity! “…symmetries can reveal the deepest secrets of physical reality” One must choose pertinent symmetries. Modeling massless boson photons with mirror-symmetric theory is fine, ditto strong interactions. Modeling fermionic matter (leptons, quarks) and weak interactions with mirror symmetric theory suffers furies of parity violations met with hierarchies of manually-inserted symmetry breakings. Observed vacuum has universal f(x) = f(-x) party-even isotropies plus selective f(x) = -f(-x) parity-odd anisiotropies (e.g., chirality) acting only toward matter. Believe what you see. Quantum gravitation, dark matter, and SUSY have zero empirical validation. It might not be parity-even achiral GR at all. It might be its parity-odd chiral superset ECKS gravitation. Opposite shoes fit with trace different energies into trace chiral vacuum. They locally vacuum free fall along trace non-identical minimum action trajectories, violating the Equivalence Principle. Eötvös experiments are 5×10^(-14) difference/average sensitive. Crystallography’s “opposite shoes” are chemically and macroscopically identical, single crystal test masses in enantiomorphic space groups: P3(1)21 versus P3(2)21 alpha-quartz or P3(1) versus P3(2) gamma-glycine. Somebody should look. isotropy plus Noether’s theorems demand conservation of angular momentum. Trace vacuum anisotropy only toward matter would source 1.2×10^(-10) m/sec^2 Milgrom acceleration in MOND. Dark matter and its Wesley Crusher physics would abruptly end, followed by a surströmming banquet. Got herring? A physicist now at MIT, Jeffrey Goldstone, had (with the help of Steven Weinberg and Abdus Salam) proved a theorem that showed that, under certain circumstances, “bad” particles—massless like the photon—somehow appear when the primeval symmetry of the universe … breaks down. Where did this particles “somehow” appear? In reality or in the theorem? What is the “primeval symmetry of the universe”? Why was this “bad”? You should either write for experts, then you can assume certain knowledge – or you should explain what you write about. And please, when you simplify something for laymen, don’t dumb it down. 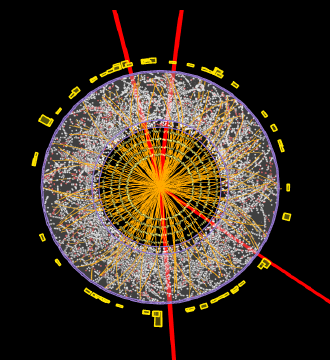 @rkdhaugoda: Well, the Higgs particle is a manifestation of the Higgs field. In an earlier post I give the best analogy I know (from A. Zee’s book on quantum field theory): The field is like a mattress, you jump on it and create waves, and a wave is also a particle because of quantum mechanics (particle-wave duality). The idea is that all particles in modern physics are handled in formulas as if they are fields. A field is mathematically amenable to manipulations by theoretical physicists, and hence its immense usefulness. Physicists often speak about “massive fields”–meaning fields associated with massive particles; and when particles interact, it is viewed as interactions of fields. @Torbjörn Larsson, OM: You are right–we don’t know the details of how particles other than the Ws and the Z get their mass (and that’s why we concentrate on seemingly-unimportant bosons that are only responsible for some kind of radioactive decay, rather than on the all-important quarks or the electron, for example). Neutrinos are the biggest mystery here and may well NOT get their mass at all from the Higgs mechanism but rather through a Majorana term in their equations–a totally different process. I just didn’t want to get into that complicated discussion, which is a side issue. But neutrinos are so mysterious for so many different reasons that we may well expect that their (extremely infinitesimal) mass may come from a different source. All this should not diminish the great importance of the Higgs: It IS a mechanism for generating mass out of a broken symmetry, and its experimental verification at CERN is of monumental importance for science. About the Anthropic Principle–see an earlier post I wrote called “Is the Universe a Giant Schroedinger’s cat?” But I have no idea whether Eugene Wigner was at all interested in anthropic arguments, and in any case, marveling about WHY mathematics works so magically well in physics and other sciences has nothing to do (in my opinion) with anything anthropic. My guess is that this is true regardless of whether you are Platonic or Kantian in your philosophy of mathematics. But I would welcome readers opinions on this. Thank you for answering the question of how the Higgs gets its own mass. When physicists say they have detected the Higgs, can you explain the mechanism? If the particle is so small that light cannot bounce off it and back to the eye of the observer, how does the scientist draw an inference that the particle exists? H–>ZZ–>M+M+M-M- This means that the very short-lived Higgs has quickly decayed into two Z bosons. These Zs live very short lifetimes, too, and each of them decayed into a muon-antimuon pair. The red paths in the picture are the muons and antimuons. Muons, luckily, have relatively long lifetimes (naturally, they are created in the upper atmosphere when cosmic rays hit nuclei of atoms, and they make it all the way down to Earth before decaying): In the lab, Muons go through everything–the entire breadth of the detector (in fact, they can make it to 100 m underground). So, thanks to the four muons, we know that a Higgs was there. What I just described was the “golden channel” to detecting the Higgs. In actuality, many of the Higgs events at CERN have been decays into gamma rays and decays into two electrons and two anti-electrons. Note that since the Higgs is neutral (has no electric charge) and so is the Z, when they decay into charged particles such as electrons, the decay must be balanced by an equal number of anti-electrons (because of the important physics law of conservation of charge: start with zero, for the Higgs, and end with zero as +1 +1 -1 -1=0. The process required an immense amount of data because the Higgs appears only rarely, and required a very sophisticated statistical analysis where Higgs events appear (after the amassing of a lot of data) as a “bump” in some curve. That bump finally became statistically significant (i.e., beyond 5 standard deviations, called 5-sigma, bounds on the curve) just before July 4th this year–hence the (rather late) discovery announcement. I recall an anecdote about Richard Feynman, how on his first day as an undergraduate he went to the campus bookstore and bought some large sheaves of paper and the biggest waste can the bookstore had. Seeing him walking back to the dorm with his purchases, one of Feynman’s professors predicted that he would turn out to be a fine scientist, since he already knew what was important – plenty of paper for doing his calculations and a big waste can where the great majority of them would end up. Feynman’s Nobel address was, to my recollection, a description of throwing a lot more good math into the waste can before coming up with the stuff that won the Nobel prize. I would guess that physicists spend a lot of time selecting from all the math available the little bit that fits the facts. Wondering about the effectiveness of laboriously selected or constructed math in the physical sciences seems like marveling over the fact that, starting with some flax plants and employing careful measurements and time-tested procedures, spinners, weavers and tailors can make a suit that comfortably fits a demanding customer. Thank you for that very clear explanation of how a particle with the life expectancy of a firefly’s glow could be detected/inferred over the length of the tunnel. I hope this next question doesn’t turn your blog into physics 101, however, there was a second aspect of my question. I would appreciate your explanation: how are the muons or any other very tiny sub atomic particle detected/inferred? My understanding, as a layman, of the implications of Heisenberg’s uncertainty principle, is that at some point the relative size/masses of the photon of light and the subatomic particle can be compared to a billiard ball colliding with a ping-pong ball. The photon of light will push the particle aside and will not rebound to the observer. Another way of phrasing my question might be how “they” took that starkly beautiful picture of the process you linked. Hi Yann, Good question. Particle detection has a long history, starting with the first bubble chambers and cloud chambers of the mid-20th century. In a cloud chamber, condensation of the “fog” or mist inside the container occurs as a charged particle goes through it, attracting or repelling charged particles in the mist, which then make the molecules condensate into drops that can be visually seen from the outside. The condensation occurs because the electric balance in the uniform mist in the container is disturbed. The droplets form a track that shows how the invading particle went through the mist! The bubble chamber, which works on a similar principle, was invented by Don Glaser in the 1950s and–I am told but haven’t confirmed this, so might be physics lore–he got the idea by watching bubbles form in a glass of beer! Beer didn’t work for detecting particles but he ended up finding a liquid that did. Here, bubbles form in the liquid, indicating where the original particle traveled. The point is: Even though these are quantum particles, as you well point out, analysis at CERN and other accelerators is surprisingly “classical.” The reason is that–as you see from the above description–many particles are disturbed by a single electron or muon of gamma ray, so you have more of a normal curve of energies of measured particles and you get statistical information. In any case, everything is done electronically: particles disturbing other particles in their path, creating currents that are measured. The only visualization occurs on the physicist’s computer screen. Hope this helps! Yes, very clear. Thanks again!